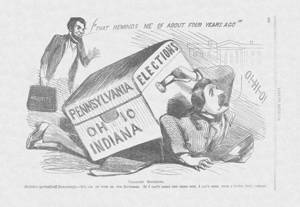 This Yankee Notions cartoon shows how Republican victories in the early state elections of major states (Pennsylvania, Ohio, and Indiana) were a heavy weight for Democrat George McClellan to carry into the November presidential election. In the background, President Abraham Lincoln comfortably carries the “Majority” bag, and begins to tell a joke comparing the scene to his first victory in 1860. Unlike some other publications, Yankee Notions appreciated the president’s humor and did not think it was inappropriate.